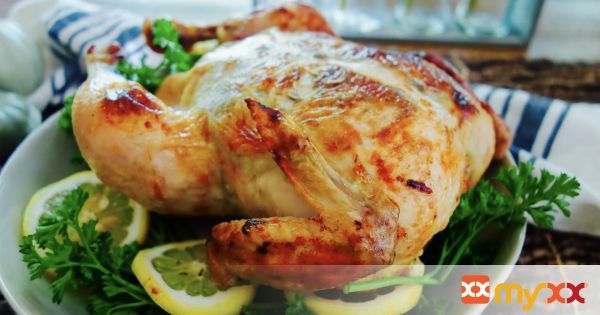 A tender, juicy lemon-herb roasted chicken. 2. In a bowl, mix the butter or ghee, garlic, thyme, rosemary and zest from 2 lemons. Add a little salt and pepper. 3. Place chicken (patted dry) inside a roasting pan. Slice one of the lemons and place inside cavity along with the onion wedges. 5. Rub the underneath side of the chicken with the butter/ghee and seasoning mixture you prepared in the bowl. (it is okay if it is lumpy) Place some under the breast skin if possible. Then rub the additional (un-herbed) butter all over the outside if the chicken. 6. Squeeze juice from the remaining lemon over the chicken, then sprinkle skin with salt, pepper and a little paprika. Generously sprinkle chicken all over with salt!